Magnified view, click on image and drag to move. Japanese military leaders recognized American naval strength as the chief deterrent to war with the United States. Early in 1941, Admiral Isoroku Yamamoto, Commander of the Japanese Combined Fleet, had initiated planning for a surprise attack on the United States Pacific Fleet at the beginning of any hostilities that the Japanese might undertake. The assumption was that before the United States could recover from a surprise blow, the Japanese would be able to seize all their objectives in the Far East, and could then hold out indefinitely. By September 1941 the Japanese had practically completed secret plans for a huge assault against Malaya, the Philippines, and the Netherlands East Indies, to be coordinated with a crushing blow on the Pacific Fleet at Pearl Harbor in the Hawaiian Island of Oahu. Early in November Vice Admiral Chuichi Nagumo was named commander of the Pearl Harbor Striking Force, which rendezvoused secretly in the Kuriles. The force of some 30 ships included six aircraft carriers with about 430 planes, of which approximately 360 took part in the subsequent attack. At the same time, a Japanese Advance Expeditionary Force of some 20 submarines was assembled at Kure naval base on the west coast of Honshu to cooperate in the attack. Submarines of the Advance Expeditionary Force began their eastward movement across the Pacific in mid-November, refueled and resupplied in the Marshalls, and arrived near Oahu about December 5 (Hawaiian time). On the night of December 6-7 five midget (two-man) submarines that had been carried "piggy-back" on large submarines cast off and began converging on Pearl Harbor. Nagumo's task force sailed from the Kuriles on 26 November and arrived, undetected by the Americans, at a point about 200 miles north of Oahu at 0600 hours (Hawaiian time) on December 7, 1941. Beginning at 0600 and ending at 0715, a total of some 360 planes were launched in three waves. These planes rendezvoused to the south and then flew toward Oahu for coordinated attacks. In Pearl Harbor were 96 vessels, the bulk of the United States Pacific Fleet. Eight battleships of the Fleet were there, but the aircraft carriers were all at sea. The Commander in Chief of the Pacific Fleet (CINCPAC) was Admiral Husband E. Kimmel. Army forces in Hawaii, including the 24th and 25th Infantry Divisions, were under the command of Lt. Gen. Walter C. Short, Commanding General of the Hawaiian Department. On the several airfields were a total of about 390 Navy and Army planes of all types, of which less than 300 were available for combat or observation purposes. The Japanese air attack on Pearl Harbor and on the airfields of Oahu began at 0755 on December 7, 1941 and ended shortly before 1000. Quickly recovering from the initial shock of surprise, the Americans fought back vigorously with antiaircraft fire. Devastation of the airfields was so quick and thorough that only a few American planes were able to participate in the counterattack. The Japanese were successful in accomplishing their principal mission, which was to cripple the Pacific Fleet. They sunk three battleships, caused another to capsize, and severely damaged the other four. All together the Japanese sank or severely damaged 18 ships, including the 8 battleships, three light cruisers, and three destroyers. On the airfields the Japanese destroyed 161 American planes (Army 74,Navy 87) and seriously damaged 102 (Army 71, Navy 31). The Navy and Marine Corps suffered a total of 2,896 casualties of which 2,117 were deaths (Navy 2,008, Marines 109) and 779 wounded (Navy 710, Marines 69). The Army (as of midnight, 10 December) lost 228 killed or died of wounds, 113 seriously wounded and 346 slightly wounded. In addition, at least 57 civilians were killed and nearly as many seriously injured. The Japanese lost 29 planes over Oahu, one large submarine (on 10 December), and all five of the midget submarines. Their personnel losses (according to Japanese sources) were 55 airmen, nine crewmen on the midget submarines, and an unknown number on the large submarines. The Japanese carrier task force sailed away undetected and unscathed. On December 8, 1941, within less than an hour after a stirring, six-minute address by President Franklin D. Roosevelt, Congress voted, with only one member dissenting, that a state of war existed between the United States and Japan, and empowered the President to wage war with all the resources of the country. 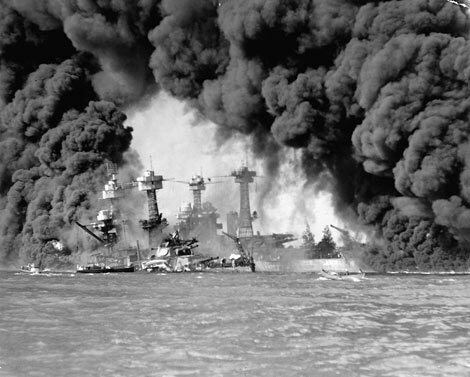 Four days after Pearl Harbor, December 11, 1941, Germany and Italy declared war on the United States. Congress, this time without a dissenting vote, immediately recognized the existence of a state of war with Germany and Italy, and also rescinded an article of the Selective Service Act prohibiting the use of American armed forces beyond the Western Hemisphere. NEW YORK — The Sept. 11 museum is taking shape 70 feet below ground, a cavernous space that provides an emotionally raw journey and ends at bedrock where huge surviving remnants and spacial voids reveal the scale of the devastation of what once was the World Trade Center. The museum's architects, director and two victims' family members led members of the news media Tuesday on a tour of the subterranean space, which commemorates nearly 3,000 people who died in the 1993 and 2001 terrorist attacks. There are no display cabinets yet, no exhibits. It is still a construction site. But it was easy to visualize the intent of the spaces, clearly articulated by the acute voids created by the fallen towers. Authentic structural elements that survived the terrorist attacks are there: the slurry wall that kept the Hudson River from inundating the Financial District, the last column of trade center steel ceremonially removed from the site in 2002; the survivors' staircase that served as an escape route for hundreds; and foundational box columns that anchored the building. The slurry wall, still in place and measuring 60 feet by 60 feet, and the other huge artifacts define the museum's design. The $45 million museum occupies about 120,000 square feet beneath the 8-acre memorial plaza, the centerpiece of which is "Reflecting Absence," two square reflecting pools set above the footprints of the north and south towers. If the museum were above grade, said architect Steven Davis, a partner at Davis Brody Bond Aedas, "you'd be saying 'wow, how cool.' But because it's underground ... the progress is less than evident." Wearing hardhats and protective eye gear, the media reached bedrock level — where the main exhibition spaces will be located — along temporary wooden stairs and a freight elevator. The din of construction equipment was deafening at times. When the museum opens in 2012, the tour will start at an above-ground glass pavilion, where a 665-foot long "ribbon," or gently sloped ramp, will carry visitors through the site. The ribbon — reminiscent of the ramp that workers used to build the original towers and during the recovery efforts following the attacks — will wind down 45 feet to the Memorial Hall, or lobby, past a three-pronged trident column recovered from the trade center rubble. The memory of the twin towers is triggered from different areas of the museum by the depth of the memorial pools in the cavernous site. The pools will be clad in a recycled aluminum material similar to that used in the original towers. Special lighting will make them appear to be floating over the space. "They exist in true reference to their place and their position on the site so you can see immediately the relationship of the placement of the memorial pools with the actual location of the tower footprint itself," Davis said. "This is something we thought was very important, this spatial accuracy." Parapets of varying heights along the ramp will reveal different parts of the museum as visitors go down. Museum architect Mark Wagner said the ramp is not intended to be a bold architectural statement, but rather an access path that allows the events of 9/11 to unfold. On Tuesday, it was still covered in rough concrete. The surface will be dark wood, while the underside will be muted, finished in dark, raw metal. Stairs or an escalator will provide the final 25-foot descent to bedrock, and to a trapezoidal expanse containing the 60-foot high slurry wall that held back the Hudson. "You begin to understand that the slurry wall is the separation between the basement of the original trade center" and the river, Davis said. The last standing 36-foot steel column that was removed from the trade center debris at the end of the nine-month recovery effort in 2002 stands in front of the slurry wall. It became a spontaneous memorial to the victims; construction workers and family members covered it with tributes, photographs and inscriptions. On Tuesday, it was sheathed in a climate-controlled covering. The tower's foundational steel box columns are exposed at bedrock in the floor slabs, providing an outline of the buildings. The federal government said the column bases and slurry wall should remain in place. The final descent runs parallel to the Vesey Street stairs, known as the survivors' staircase, encased in wooden scaffolding on Tuesday. The 37 steps served as an escape route for people fleeing. It stood for years as the last remaining above-ground remnant of the original complex. There are also several places where visitors can stand between the remnants of the two towers. Thousands of unidentified remains of 9/11 victims will be stored in the museum, in an area reserved for the medical examiner's office; an adjacent room will be set aside for family members. These areas will be off limits to the public. A quotation from Virgil's "Aeneid", "No Day Shall Erase You From the Memory of Time," will be incised into the wall that separates the private and public spaces. "The wall is only a membrane that separates us from them, and it's our obligation to remember," said museum director Alice Greenwald. Anthoula Katsimatides, whose brother died in the attacks, said she hoped visitors will "learn something about one of those beautiful people who passed away on that day" and come away with "a sense of peace and a sense of hope." The idea for the museum design began with "all the things we were given," the remnants of the complex. "A traditional museum design is an icon which contains exhibits," he said. "But this museum, the icon is the exhibit." JUNE 5 (Friday)-evening “launch” celebration in NY Harbor with the Blessing of the Fleet, and festivities at Battery Park. JUNE 6 (Saturday)-early morning with 6am pick-up of dignitaries at Manhattan Yacht Club. o 7am start of flotilla at Statue of Liberty. o Pilot boat arranged to take dignitaries off ships at 79th Street Boat Basin. o Overnight for flagships-Onrust at Nyack Boat Club, all others at Paul Janos and vicinity in Tarrytown. JUNE 7 (Sunday)-departure at 8am. o Arrival in Haverstraw by 11am for midday celebration, leaving Haverstraw by 2pm. o Arrival and welcome in Beacon/Newburgh around 5pm. o Overnight for flagships-Clearwater, Mystic and Woody in Beacon; Half Moon, and Onrust in Newburgh. JUNE 8 (Monday)-flagships stay in Beacon/Newburgh for educational programs all day. JUNE 9 (Tuesday)-flagships stay in Beacon/Newburgh for educational programs all day. o Depart Beacon/Newburgh at 4-5pm. o Arrival and welcome (7pm) in Poughkeepsie area. JUNE 10 (Wednesday)-flagships remain in Poughkeepsie all day for educational activities. o Depart Poughkeepsie at 4-5pm. o Arrival and welcome (6:30pm) in Kingston for overnight. JUNE 11 (Thursday)-remain in Kingston for school groups from 8 to 11am. o Arrive and circle Saugerties Light House around noon to 2 for school groups. o Arrival and welcome in Catskill/Hudson/Athens by 6pm. o Overnight for flagships-Half Moon in Catskill, Clearwater in Hudson, and Onrust in Athens. JUNE 12 (Friday)-remain in Catskill/Hudson/Athens area for school groups until noon. o Arrival in Castleton at 4 for final night and fireworks. o Overnight for flagships-Clearwater and Onrust at Castleton Boat Club, Half Moon at Brick Yard. JUNE 13 (Saturday)-depart Castleton at 11am. Independence Day fireworks will return to the City of Poughkeepsie for the first time in more than 20 years, officials said today. Mayor John Tkazyik announced a fireworks display is set for July 4th in Waryas Park along the Hudson River. The mayor said he hopes the display will encourage residents to stay in the city for the holiday and patronize local businesses. “This year, it is more important than ever to keep our business local,” Tkazyik said. He said the fireworks will cost about $10,000 and could be funded with help from local banks and other private donors. Tkazyik said Independence Day fireworks were held for years at College Hill, but were eventually discontinued due to lack of funding. Officials believe the city's last July 4th fireworks display was held along the river in the mid-1980s. The Statue of Liberty, which has been closed to visitors sine the 9/11 attacks in 2001, will be open to the public again starting July 4th. WASHINGTON - Lady Liberty may be welcoming visitors back into her crown for the 4th of July holiday,Interior Secretary Ken Salazar said Tuesday. Salazar said "we will endeavor to do everything we can" to have the Statue of Liberty and its thrilling spiral staircase climb to her crown open to the public by America's 233rd birthday - the first time since the Sept. 11 attacks. "We may have it opened up to a smaller group of people," he told Reuters. Salazar said his department, which controls the landmark, is considering implementing a ticketing or lottery system to allow small groups of people to enter the crown at specific times, similar to crowd control and safety procedures at theWashington Monument on the National Mall. "I can't think of a better birthday present for our nation. Reopening the crown of Lady Liberty will restore a quintessential New York and American experience," saidRep. Anthony Weiner (D-Brooklyn/Queens). Salazar's announcement followed a drumbeat of 23 Daily News editorials over six years urging the crown be re-opened to the public. But before the plan can go forward, Lady Liberty has to clear one final safety check - a hurdle Salazar anticipates the monument will clear. He is awaiting an April 15 security assessment, which will lay out options on how to proceed. "Those are the kinds of things we're looking at with our aspiration being that we do have the Statue of Liberty opened up," Salazar said. The National Park Service, the Interior agency that cares for Liberty Island, shut down the Statue after the Sept. 11 attacks, citing security concerns. Liberty's base, pedestal, and observation deck were re-opened in August 2004, but the crown remained closed - the only site in the National Park system off-limits to the public since 9/11. Salazar said there were still safety concerns about having crowds on the spiral staircase in case of an emergency, but suggested that risk could be minimized by having only small groups in the crown at any one moment. Weiner and other New York City officials have pushed to have the Statue re-opened, but were blocked by the Bush administration's safety concerns. While the number of visitors to Lady Liberty, which the U.S. received as a gift from France in 1886, fell in the aftermath of 9/11, attendance has climbed in recent years - to 3.2 million in 2007. NEW YORK (Billboard) - Bruce Springsteen, Dave Matthews, Eddie Vedder, John Mellencamp and Emmylou Harris are among the dozens of musicians who will celebrate American folk music legend Pete Seeger's 90th birthday with a gala concert at Madison Square Garden on May 3. The event, dubbed "The Clearwater Concert: Creating the Next Generation of Environmental Leaders," will raise funds and awareness for Hudson River Sloop Clearwater, an environmental organization founded by Seeger in the 1960s to preserve and protect the Hudson River. Other artists scheduled to appear include Steve Earle, Joan Baez, Juanes, Richie Havens, Kris Kirstofferson, Tom Morello, Billy Bragg, Michael Franti and Ben Harper. Celebrations honoring Seeger's musical legacy and social activism will go on throughout the year. The Madison Square Garden birthday concert is part of a series of 90th birthday events benefiting Clearwater, which is also marking its 40th anniversary. Wilco's Jeff Tweedy will play a rare acoustic solo set at Clearwater's annual "Spring Splash" fundraiser in Beacon, N.Y., on March 28. Tweedy and Seeger will perform together at the sold-out event. Blues singer Susan Tedeschi, folk hero Arlo Guthrie, "newgrass" sensations Old Crow Medicine Show and Alejandro Escovedo are some of the artists headlining the annual Clearwater Festival in Croton, N.Y., on June 20-21. The Persuasions, indie favorites Dr. Dog and Elvis Perkins in Dearland, New Pornographers frontman A.C. Newman, and Allison Moorer are among the dozens of other performers announced Wednesday on the festival's website (http://www.clearwater.org/festival/performers.html). Seeger will be performing numerous times during the two-day festival, and his grandson (and frequent collaborator) Tao Rodriguez-Seeger will also play a set with his band. All of the money raised at the events support Clearwater's environmental research, education and advocacy efforts to help preserve and protect the Hudson River. American Express pre-sale tickets for the Madison Square Garden concert will be available starting March 23, and sales to the general public begin March 30. More information can be found at www.Seeger90.com (http://www.Seeger90.com). Asked last year by Billboard what his legacy will be, Seeger replied, "My family will remember me, and a few others. I'm one of a lot of songwriters. There'll be more important things to think about." With the 40th anniversary of the original Woodstock festival coming this August, organizers are hoping to honor the famed musical event with a pair of free two-day concerts taking place in both New York and Berlin, Germany, TheRockRadio.com reports. According to promoter Michael Lang, the New York festival will take place exactly on the 40th anniversary, August 15-16th, while the Berlin event will go down August 22-23rd at an abandoned airport. The exact location for the U.S. festival has not been determined. No bands have yet been named for either festival, but organizers reportedly hope to recruit some of the acts that played the original fest in 1969, namely the Who, Santana, the Grateful Dead and many more. The official Woodstock Website offers no details as it’s currently “under construction.” Lang is credited as a co-creator of the original Woodstock, showing up numerous times in the documentary about the festival. He also played a role in producing both the Woodstock ‘94 and the Woodstock ‘99 festivals. Woodstock ‘09, if it comes to be, would be the first big festival under the Woodstock moniker since the ‘99 weekend. That three-day event became more infamous for its unruly crowds than the actual music and helped negate the whole “peace & love” spirit of the original festival thanks to a weekend’s worth of violence and looting. Artists like Insane Clown Posse, the Red Hot Chili Peppers, Kid Rock and Limp Bizkit were accused of inciting the crowd, leading to bonfires and melee in what in retrospect is regarded as a disaster. Though its waters flow nearly a mile from the Albany Institute, the majestic power and rich history of the Hudson River will flow through the museum in 2009 as we welcome Hudson River Panorama: 400 Years of History, Art, and Culture. This unprecedented year-long exhibition will commemorate Henry Hudson’s 1609 exploration of the river that bears his name, and the remarkable narrative of the people, events, and ideas that have shaped this magnificent region. Complementing the Hudson-Fulton-Champlain Quadricentennial—an international celebration stretching from New York City to Quebec Province—Hudson River Panorama will explore and narrate the influential force that the Hudson has had on our region, including settlement, agricultural cultivation, industrial growth, tourism, and the cultural prominence of the region's talented and creative artists, writers, architects, and landscape gardeners. For more than three years, the Albany Institute has been researching topics related to the Hudson River in preparation for the exhibition and accompanying educational programs. The process has been a journey of exploration and discovery, unearthing accounts of the people and events that have shaped the history of the Hudson Valley. With a topic as vast and wide-ranging as the Hudson River, selecting key events, people, innovations, and ideas to relate broader narratives of the river has been both crucial and challenging. Visitors will rediscover the flora and fauna of the Hudson River Valley and compare historic and contemporary images that reveal how the human presence has shaped and changed the appearance of the river over the last 200 years. The exhibition is also designed to reveal interconnections among the various topics, with occasional surprises and unexpected associations. Whether you are visiting the Albany Institute from the Hudson Valley or anywhere on the globe, Hudson River Panorama promises a stimulating and enjoyable look at one of America’s great rivers and the people and history it helped to shape. John Koopman as George Washington will welcome you to his birthday celebration. Bring the family to George Washington's Birthday Celebration at the nation's first historic site February 14, 15 and 16th! From 12:30 pm to 4:30 pm each day at Washington's Headquarters in Newburgh, you can meet the man himself along with other famous people from 400 years of Hudson River history. Each day will feature a children's craft, and either a puppeteer, storyteller, or a military demonstration. The headquarters building itself will be filled with music and available to tour at your own pace. Admission by donation. Washington's Headquarters, located on the corner of Liberty and Washington Streets, offers a scenic view of the Hudson River. Handicapped parking available. Supported by The Hudson-Fulton-Champlain Quadricentennial, The Palisades Interstate Conservancy, The Friends of the State Historic Sites of the Hudson Highlands and Price Chopper's Golub Foundation. Washington's Headquarters is part of the Palisades Interstate Park Commission which administers 29 parks, parkways and historic sites for the Office of Parks, Recreation and Historic Preservation in New York as well as the Palisades Interstate Park and parkway in New Jersey. For information about New York State parks and historic sites, please visit www.nysparks.com and for more information about the Palisades Interstate Park parks and historic sites, please visit www.palisadesparksconservancy.org. Is it a car? Is it a plane? Actually it’s both. The first flying automobile, equally at home in the sky or on the road, is scheduled to take to the air next month. If it survives its first test flight, the Terrafugia Transition, which can transform itself from a two-seater road car to a plane in 15 seconds, is expected to land in showrooms in about 18 months’ time. Its manufacturer says it is easy to keep and run since it uses normal unleaded fuel and will fit into a garage. The Transition, developed by former Nasa engineers, is powered by the same 100bhp engine on the ground and in the air. Terrafugia claims it will be able to fly up to 500 miles on a single tank of petrol at a cruising speed of 115mph. Up to now, however, it has been tested only on roads at up to 90mph. Dietrich said he had already received 40 orders, despite an expected retail price of $200,000 (£132,000). “For an airplane that’s very reasonable, but for a car that’s very much at the high end,” he conceded. There are still one or two drawbacks. Getting insurance may be a little tricky and finding somewhere to take off may not be straightforward: the only place in the US in which it is legal to take off from a road is Alaska.